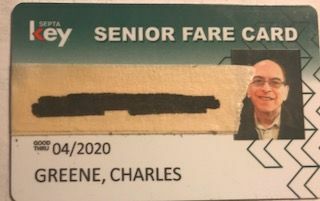 Posted by TransitChuckG on Fri Aug 10 11:18:40 2018, in response to Re: Seniors to ride free on Septa RR, out of State seniors, posted by TransitChuckG on Fri Aug 10 10:00:47 2018. I'm so happy that I got my Senior Card last year. It's great that you now get it on the spot, I had to wait 4 months for mine. Yeah, technology!